Cachelan provides internet monitor and control portals for management of renewable energy using smart grid technology. A solar PV system is a big investment that only creates revenue when it is generating electricity. When problems occur, the site owner needs to be alerted and have the necessary analysis tools for troubleshooting to prevent loss of revenue. A comprehensive energy portal is a valuable tool that will pay for itself from initial commissioning to lifetime maintenance. It should be evaluated and selected with the same care that goes into other systems components. 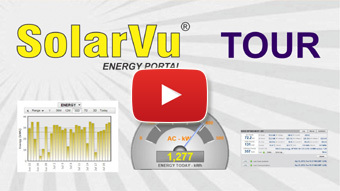 SolarVu® is a web energy portal that continuously monitors solar array performance displaying power, energy, revenue, status and trends on a PC or mobile device. SolarVu® can be installed on systems of any size. It works with inverters and optional equipment from many different vendors. IPPs (independent power producers) can use SolarVu® to manage their PV sites to maximize return on investment. Receive a daily email report of income earned from your solar generation system. Get an alarm message if problems occur. Remotely view live inverter measurements to speed up troubleshooting. Check your carbon footprint reduction and learn about energy equivalents. Calculate expected ROI with the payback calculator. Detect bad panels with SmartStrings™. Evaluate expected performance to actual under varying weather conditions with WeatherTrak™. Read about these and other features then visit live sites to see how they will work on your site when installed. Ask your project developer or installer to include SolarVu® on your solar PV projects. If you are considering your first investment in solar power for your residence, commercial building or property visit live SolarVu® sites to see how they perform over time. A solar association can provide incentive information and a dealer member list. Get quotes from an installer or project developer. They can help you evaluate which options best suit your needs. Once built, use SolarVu® to keep your investment producing at maximum output.